Okay, so Chris Pratt is funny, super hot, and pretty much the sweetest guy in Hollywood. 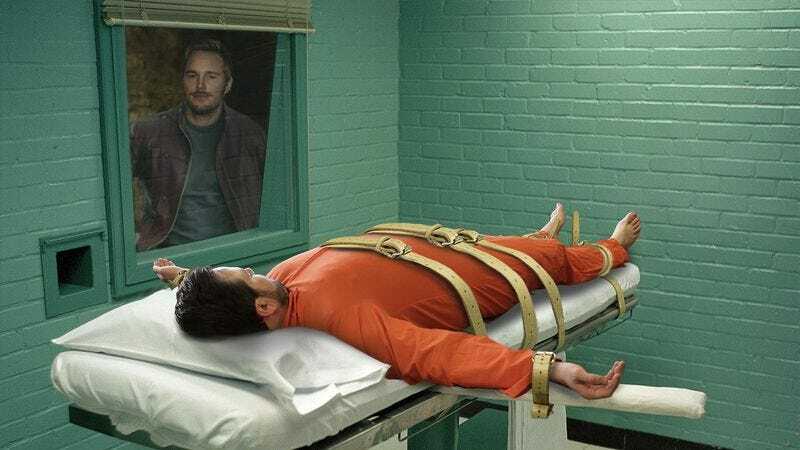 And If you have even a single doubt that he is as bighearted as they come, this story will change your mind in a hurry: When Chris heard that one of his fans was on death row, he traveled all the way from Los Angeles to Indiana to show up at their execution dressed as Star-Lord! Um, yeah. Anna Faris? You are the luckiest woman on the planet. Chris surprised 43-year-old Walter Millwood on the day Walter was set to die by lethal injection, and he did so while wearing the actual costume he donned during filming of Guardians of the Galaxy. Sure, Chris could’ve spent his free time rubbing elbows with other A-listers in Malibu. But instead he took a few hours out of his busy schedule to brighten the day of a fan who was being pumped full of pancuronium bromide, and that’s what makes this Parks And Rec star so amazing. As Walter was escorted into the lethal injection chamber, there was Chris in the viewing booth busting moves from Star-Lord’s iconic dance-off. Pratt also recited a few of Star-Lord’s catchphrases as Walter’s heartbeat slowly succumbed to the drug cocktail administered by the state of Indiana. And even though he was only expected to be there for a few minutes, Chris was in no rush to leave, and stayed until after Walter was officially declared dead by the prison physician. What a guy! It’s so heartwarming to see an actor of Chris Pratt’s caliber do something as selfless as this, and there’s no doubt that his amazing visit put a smile on Walter’s face before the fatal dose of sedatives made that impossible for him to do. So that settles it: Chris Pratt fans are the luckiest people in the world!